Shopping period has officially concluded! We can now dig into our classes and look forward to our spring TD Community Night this Tuesday at 8:30pm in the TD Dining Hall. Over the weekend I received pictures of TDers in Singapore who are currently there working or studying. So our “photo of the week” is titled “Àshe from Singapore” and features Kento Tanaka ’20 who is at Yale-NUS this semester. (Note the vintage TD Day shirt!) On the right is Jun Yan Chua SY ’18, whose history senior essay I advised. 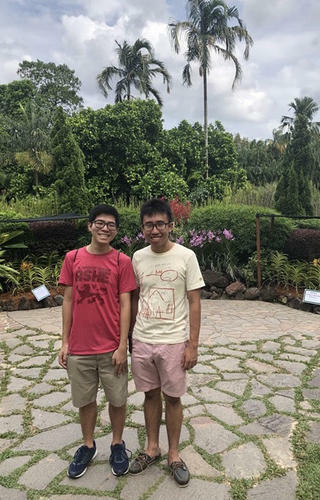 Yan is from Singapore and kindly met up with Kento for a tour of the Singapore Botanic Gardens. We are still #2 in the Tyng Cup standings! Tonight, we can use all of our TD swimmers for the IM Swimming Preliminaries from 9-10pm at PWG! If you are able to go please meet in the TD courtyard at 8:40pm. Any questions, please email angel.mora@yale.edu. It looks like the 20 spots for the the IRIS 5k run I now taken. But we are adding 5 more spots! So go ahead and use the same code (TDYALE) to sign up for one of the 5 new spots. And we may also sponsor one more race later in the spring. So TD runners there should be one more opportunity to do a group race this spring. Questions about budgeting, saving, investing and taxes? Need rules of thumb? Join Yale alumnus/financial planner John Caserta ‘01 for “Financial Life After Yale.” Started in 2013, Blum has done more than 170 of these sessions and worked with more than 4,000 Yalies. To register, RSVP here and complete a very quick one-minute survey. Feel free to also drop-in. Hot chocolate and cookies will be served! Second and last session of this year’s Fireside Chats. So this is your last chance! If you need to check the signup list, please go to this link. First Mellon Forum of the spring semester! The series will continue to take place on Tuesday nights throughout the semester so please mark your calendars! Last Mellon Forum will be on 4/9. Come get your seats for a great evening of performances from the TD community! We have a full schedule of music, magic, comedy, and much more! We’ll have our usual pizza intermission at the halfway point! Our first tea of the semester features Professor Peter Loge of George Washington University who will be talking on the topic “Return to Ethics in Political Communication.” Professor Loge is the Assistant Director in the School of Media and Public Affairs and has had a long career in Washington, D.C. serving under Senator Edward Kennedy and three members of the US House of Representatives, and in the Obama administration contributing to the passing of the Affordable Care Act. His new book, Political Communication Ethics: Theory and Practice will be due out in 2020 and he will also serve as the Director of the Project on Ethics in Political Communication, which is launching on March 5th of this year. We still have a couple of spots for dinner after the tea. Please email me at mary.lui@yale.edu if you would like to join the dinner. Last week’s meet up was a great success! Our graduate affiliate, Sumita Ghosh, has kindly offered to meet weekly. Beginners are definitely welcome to join in and learn to knit. Please email sumita.ghosh@yale.edu if you would like to join in or just stop by the knitting circle. Race packet pick-up at 8:30am and the run begins at 10am at Wilbur Cross High School, at the base of East Rock Park and a nice walk from TD. Even if you are not running, it’s a great to go out and support and cheer! Go here for more information. February 1, Friday Last day to withdraw from a course offered in the first half of the spring term without the course appearing on the transcript. See Withdrawal from Courses and Grades. 1) Transfer requests are not guaranteed, and you are strongly encouraged to have a housing option within your own college should your transfer be declined. 2) In order to transfer to another residential college, you will need to have a current student in that residential college sponsor your transfer and agree to live with you for the next academic year. Please note that any single student may sponsor no more than two candidates to transfer into their college in an academic year. 3) If your transfer is approved it is a binding decision, so please consider your request carefully before submitting your application. 4) If your transfer is approved and you later change your mind about the housing arrangement you had committed to on your form, your transfer may be revoked. You may also be subject to the policies and penalties of the applicable residential college housing rules. 5) Each residential college will decide whether or not they wish to interview potential transfer candidates, and if they do interview them, how and when they might do so. It is your responsibility to check with the staff of the residential college you wish to transfer to. 6) Only completed applications may be submitted and the deadline is Friday, February 8, 2019. Students will be notified of the transfer decisions by the end of February. August 15th and participate in the entirety of the program and attend Spring training on March 29thfrom 12-2pm. Applications are due on February 8th at 5pm (EST).